11-Aug-2003 -- Since all Confluences in our home country Germany have been reached already, we were not so attracted to confluence hunting there. But this August, during our bike tour between Hanoi and Phnom Penh, was a good opportunity to find unvisited confluences. This is the second of a series of seven Confluences. The first is 20N 106E. Our bike tour started in Vietnam's capital, Hanoi. After riding 590 km in 9 days we reached the border between Vietnam and Laos at an 800 m high border pass called Cao Treo. From there we went over very remote jungle road to a small place called Lak Sao in the eastern Bolikhamsai province of Laos. The small town has officially 21,000 inhabitants, but arriving there we found ourselves at a simple crossroads with only a couple houses. Since Lak Sao is only about 20 km from the Confluence, we wanted to give it a try. After spending the night in the jungle town, we went southwards with our bikes to go for our second Confluence. On the main road, you can get as close as 5 km to the point. From there it is at least a 5 km hike through a mountainous dense jungle, even though lumber companies are currently very busy transforming the forest into waste land. Laos gets a lot of rain during summer, in particular these mountain ranges. Thus, the jungle is full of impassable waterways. When we arrived at a huge bridge in the village Keng Deng, we saw a couple of wooden boats on the river called Nam Theum below us. Looking on our map and following Nam Theum with fingers on the map, it was clear, how we could reach the Confluence: By boat. If we followed the river downstream we could approach the Confluence within a couple 100 meters. At the bridge, we asked for boats going downstream on the Nam Theum. Soon we had a crowd of interested spectators gathered around us, but none of them could speak a single word of English. Nevertheless, we pointed to our map and pointed to the boats and finally the people from the village Keng Deng understood what we wanted. A boy seemed very happy to offer us a ride in his boat. He showed us an alternative route where he wanted to take us. But his route wouldn't bring us closer to the Confluence. Only after insisting to go our route, he finally agreed. Asking for the price for that 10 km trip, he insisted on 40 US-$. This was way too much, in particular taking into account the average prices and wages in Laos. We didn't want to pay that price but we also didn't want to give up, so we decided to head back to our hotel in order to get an interpreter (our receptionist could speak English). So we rode back to the hotel on our bikes and he followed us on a motor bike. We then explained our intentions to the hotel manager. After that, the hotel manager and our boat owner discussed it for 10 minutes in Lao language. We really didn't know what was going on. Our hotel manager was also astonished to hear such an astoundingly high price. When he asked why, the answer opened our eyes: To take our desired route would mean passing through high risk rapids, which the boat's owner himself had never ventured before. At that point, we were glad to have consulted an interpreter. We said "No, thanks!" to the boat owner and continued our tour. But I didn't want to give up. We rode our bikes westward from Lak Sao on Route 8. After about 40 km on the road, we crossed the river Nam Theum again, this time about 50 km downstream of the Confluence. If an approach from upstream was too dangerous, why not try from downstream? Indeed, right at the bridge we managed to find an old man with a small motorboat who was willing to take us upstream. 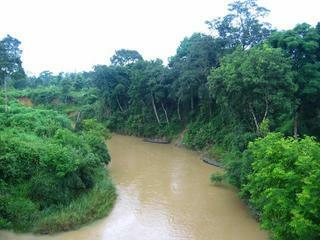 He took us through beautiful scenery along the river and we were able to see almost untouched jungle life. The only drawback was his slow speed and the curviness of the river. After one hour, the distance diminished from 50 km only to 42 km. It became clear, that we couldn't make it on that day. So we decided that there are other things in life besides visiting Confluences and we turned around. This story is continued at 17N 105E.